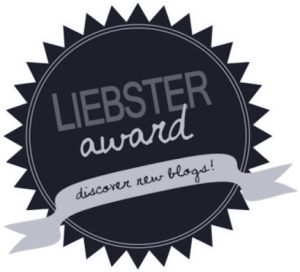 Thanks very much to Jessica at ellDimensional for giving me the Liebster Award! So you’re supposed to write 11 facts about yourself (why 11? such a random number), then answer 11 questions posed by the person who gave you the award, then write 11 questions for the people to whom you give the award. 1. I don’t put milk in my cereal. For some reason, it grosses me out. 2. I was born in the Year of the Dragon. Maybe that explains why I like dragons so much. 3. I’ve been to a tractor pull. You have to be Southern to enjoy them. 4. I’ve never been on a roller coaster. They’re scary. 5. Someone once told me that I reminded them of Adrian from the Rocky series. 7. My normal wake-up time is 5:30. My bedtime is somewhere between 9 and 9:30. Even on weekends. Not sure how healthy, wealthy, or wise that makes me. 8. As much as I love talking about myself on this blog, I hate talking about myself in real life. 9. I don’t like writing in composition books or any kind of notebook that isn’t spiral bound. I like something that can fold over easily. 10. This might be an introvert thing: I really dislike talking to people but really enjoy watching them. 11. I’ve never had my nails done, and the last time I painted them must have been more than 10 years ago. I guess 7 or so. I wrote my first “real” story when I was 9. I remember forcing myself to write one page a day until the story was done, because I had started a few stories by that time but never finished them, and (even at 9) I was mad at myself for that. So I did finish the story—and yes, I still have it, and sometimes I think upon it with much affection. 2. If you could move anywhere, where would you go? Somewhere with fewer cars and fewer people, so I can be a hermit. 3. Do you have a familiar–I mean, a pet? William Faulkner’s The Sound and the Fury because he takes fairly ordinary events and a fairly ordinary Southern family and transforms them into something of beauty and lasting significance. 5. What are your other hobbies? Reading, teaching catechism classes, walking extremely fast wherever I go, being Captain Obvious. 6. If you become any age you wanted, what age would that be, and why? Maybe 11. You’re not exactly a child anymore, you’re not in the annoying teenage years yet, and you don’t have any adult responsibilities. 7. If you could travel to any time or place, where would you go? Sicily, the land of my ancestors. Nope. I find tattoos fascinating, but I wouldn’t want any of my own. 10. What is your favorite food/dish? 11. What is the most recent book you’ve read? Thanks again to Jessica for nominating me! That must have been fun to write about! Very interesting facts! The Sound and the Fury is on my to-read list, I will definitely have to bump it up on the list since I have yet to read Faulkner. And 11 is a great age — but how I wished to be a teenager when I was 11! I couldn’t wait to grow up, and now I just wish time would stand still. And that is a lot of pets! It must be quite lively in your home sometimes!